Barcelona forward Luis Suarez has conceded that a player of Paul Pogba’s quality would be welcome at the Nou Camp amid ongoing speculation over his future at Man Utd. As per The Guardian, Pogba seemingly raised doubts over his own future last month when he suggested that he wasn’t entirely happy at Old Trafford. Given the early struggles that the Red Devils have had in losses to Brighton and Tottenham, question marks over the future of one of their most influential players is the last thing that Jose Mourinho needs. 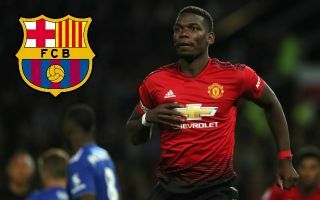 Nevertheless, those quotes certainly hinted that not all is well at United, and Gerard Pique stoked those flames last week as he revealed that he would be pleased to welcome Pogba to the Nou Camp in the future, as noted by the Metro. It appears as though Luis Suarez has taken a leaf out of his book, and while the Barcelona stars will need to be careful that they don’t irritate Man Utd into calling for action to be taken for their ongoing comments on a player at a different club, they are seemingly not shy in opening the door for the French international. Barcelona have been busy reshuffling their midfield this summer with Arthur and Arturo Vidal arriving after Andres Iniesta and Paulinho both left. However, with reports such as the one from the Daily Star continuing to link the La Liga champions with a future swoop for the 25-year-old, time will tell if Pique and Suarez get their wish and see Pogba arrive as a new teammate next year having both now welcomed the idea publicly.